Vitali Bondarenko is a Ukrainian born artist with a prestigious history in the Ukraine art community. 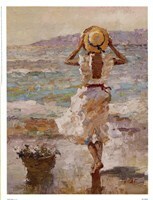 He is most famous for his figurative and landscape work, and this second image in his “Seaside Summer” series is a great example of his exemplary work. “Seaside Summer II’ features a young girl in a flowing white dress and sunhat playing with a sailboat on the beach. She’s just on the edge of the water, with the blue and white waves of the ocean behind her. The sand of the coast is also visible in this image, with a small gathering of trees in the distance. The sky is various shades of gray and blue, with a little bit of pink creeping in, representative of a hazy sky as often seen on the beach. Painted in an impressionistic style, the brushstrokes and attention to detail are very evident in this piece of art. Bondarenko has taken great care to create a feeling of warmth and relaxation in creating this work. A white frame would be a great finishing touch when hanging this picture in a beach house or beach themed-room. A natural wood frame is also a great choice for blending with other décor styles in your home.